Prisoners and reoffending: caught in the revolving door? "...people don't end up in prison generally speaking for a first offence. Normally the people who end up in our prisons have offended again and again"
"it is generally not the case in our society that most people who go to prison do so for a first offence. They are people who have had community sentences, the vast majority of people in our prisons — and in short sentence prisons it is something like 95% - have had cautions, have had community sentences first"
Reducing reoffending and improving rehabilitation is a key Ministry of Justice policy. Already this year the Justice Secretary has announced that all prisoners will receive supervision for at least a year after they leave custody. Currently the probation service only provides this for people with sentences of more than a year. At the same time, all but the most serious offenders will be dealt with on probation by private and voluntary sector organisations rather than the existing probation service, as part of the department's flagship 'payment by results' scheme. Part of the problem, as Chris Grayling admitted on Sky News yesterday, is that most people in prison already have a history of offending. There's a lot of data in evidence for what the Justice Secretary is saying. It's fair to say that a 'typical' prisoner is likely to have several previous offences on their record. Only 13% of sentenced prisoners (that's excluding people there on remand) have no previous convictions or cautions to their name, according to the Ministry of Justice's annual prison population tables. 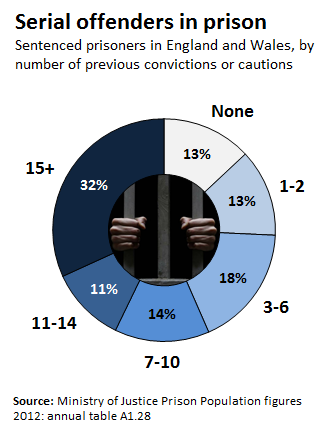 Nearly one third (32%) have been convicted or cautioned more than 14 times previously. The case is quite different for women prisoners - over a quarter (26%) are in prison for their first offence, while slightly more (27%) have a record of 15 or more offences. The Justice Secretary quotes a figure as high as 95% for the number of people who've had previous offences to their name at 'short sentence' prisons. The numbers just about back him up: 94% of prisoners across England and Wales serving sentences of under six months have at least one previous conviction or caution. Half have 15 or more. So a considerable number of people in prison have a history of crime. However, while the numbers are high they don't tell the full story of what these histories actually involve. Not all of the current batch of 'serial' offenders will have been in and out of prison. Many of their previous convictions could have been minor cautions at least. The Ministry of Justice produces some evidence on reoffending patterns. It aims to compare how often serious offending leads to serious reoffending. Based on a year's offending history (so only offences within a year of each other are included), half of people sent to prison in 2011 had either previously served a community sentence (32%) or been given a fine (17%). Over a quarter (27%) had already served another prison sentence. How many of those convicted of knife crime go to prison? Locked up and litigious: what are we spending on legal aid for prisoners? Release from prison: how early is too early? Less time in prison, more likely to reoffend? Are criminals caught in a revolving door of community sentencing? Is the probation service keeping criminals in check? Were a quarter of prisoners in care as children? Does reoffending cost the country £11 billion? Is re-offending at a record high?